So fellow travelers, Lake Ontario continues to spread her fluffy white presence through the streets and by ways of our towns and villages. The three day MLK Jr. weekend has been extended to a fourth day off by a snowday. It will mean some quick assignment rewrites for my teaching colleagues who have to wrap up the semester by Friday. Still, I am truly grateful to avoid driving in the blustery winds and periodic white out conditions haunting my view from the big window over my deck. 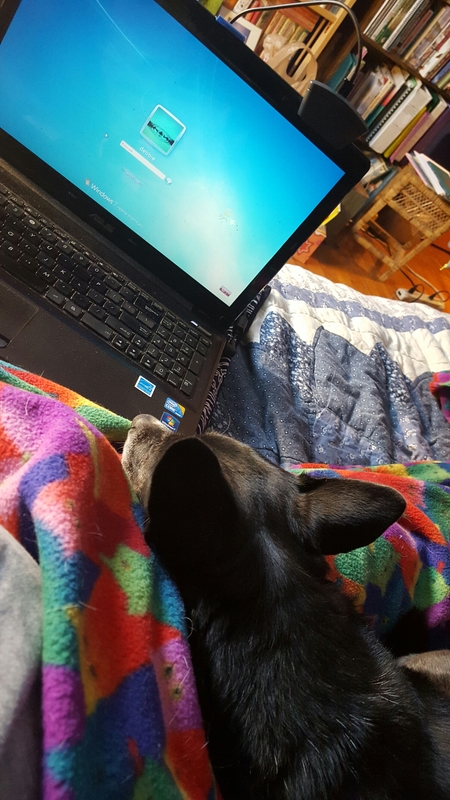 After a round of shoveling, required to access the yard for the morning dog run, I have settled down to complete a few writing assignments of my own. Delilah immediately made it clear who wins the battle for the favored spot on this snowed in morning.